Antique Rare Hereford Mappa Mundi. Extremely rare lithographed large size facsimile of the famous c. 1300 Hereford Mappa Mundi. Produced in London in 1869, by Stanford. It was reported by Rev. F.T. Havergal in the Transactions of the Woolhope Naturalists’ Field Club for 1870 (p. 253) that only 50 or 60 subscribers had committed to purchase it, which makes this an extremely rare and valuable facsimile of the largest medieval world map that survived into the 21st century. It depicts 420 towns, 15 Biblical events, 33 animals and plants, 32 people, and five scenes from classical mythology. Jerusalem is drawn at the centre of the circle, east is on top, showing the Garden of Eden in a circle at the edge of the world. Great Britain is drawn at the northwestern border. Curiously, the labels for Africa and Europe are reversed, with Europe scribed in red and gold as ‘Africa’, and vice versa. The map is based on traditional accounts and earlier maps such as the one of the Beatus of Liébana codex, and is very similar to the Ebstorf map, the Psalter world map, and the Sawley (erroneously for considerable time called “Henry of Mainz”) map. It does not correspond to the geographical knowledge of the 13th century. Note, for example, that the Caspian Sea connects to the encircling ocean (upper left); this is in spite of William of Rubruk’s having reported it to be landlocked in 1255, i.e. several decades before the map’s creation; see also Portolan chart. The “T and O” shape does not imply that its creators believed in a flat Earth. The spherical shape of the Earth was already known to the ancient Greeks and Romans and the idea was never entirely forgotten even in the Middle Ages, and thus the circular representation may well be considered a conventional attempt at a projection (looking down on a sphere): in spite of the acceptance of a spherical Earth, only the known parts of the Northern Hemisphere were believed to be inhabitable by human beings (see antipodes), so that the circular representation remained adequate. The long river on the far right is the River Nile, too, and the T shape is established by the Mediterranean Sea and the rivers Don and Nile. It is the first map to mention the Faroe Islands. The Hereford Mappa Mundi hung, little regarded, for many years on a wall of a choir aisle in the cathedral. During the troubled times of the Interregnum, 1649 – 1660, the map had been laid beneath the floor of Bishop Audley’s Chantry where it remained secreted for some time. In 1855 it was cleaned and repaired at the British Museum. During the Second World War, the Mappa Mundi and other valuable manuscripts from Hereford Cathedral Library were kept elsewhere in safety and returned to the collection in 1946. 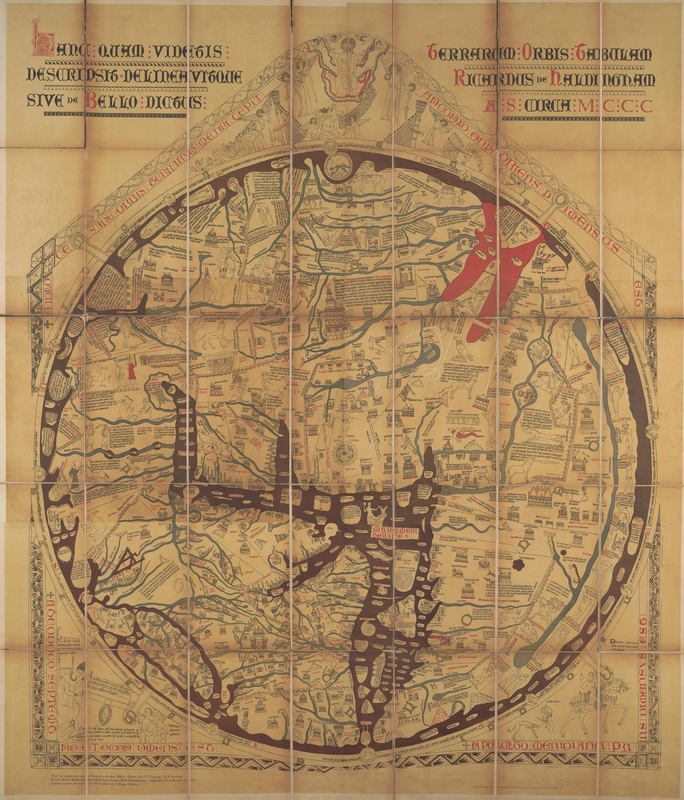 In 1988, a financial crisis in the Diocese of Hereford caused the Dean and Chapter to propose selling the Mappa Mundi. After much controversy, large donations from the National Heritage Memorial Fund, Paul Getty and members of the public kept the map in Hereford and allowed the construction of a new library to house the map and the chained libraries from the Cathedral and All Saints’ Church. The new Library Building in the southeast corner of the Cathedral opened in 1996.